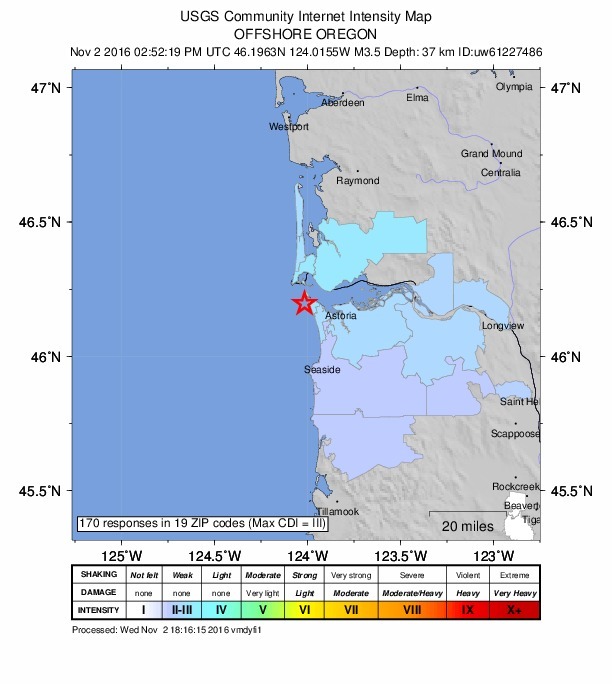 We just had an earthquake with an epicenter that plots near Warrenton, Oregon (at the northwesternmost tip of Oregon, near the mouth of the Columbia River). Here is the USGS website for this M 3.5 earthquake. Even though it is a small earthquake, it was felt by many (almost 200 people). This earthquake has an epicentral depth of ~38 km, well below the megathrust fault at this location. 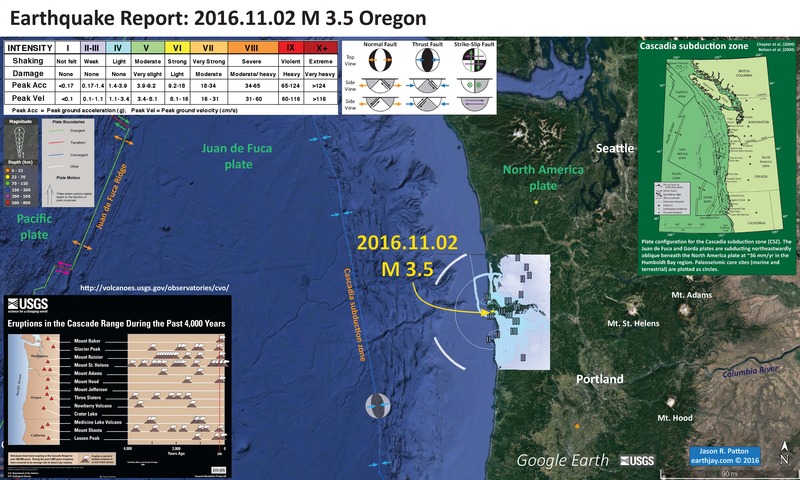 So, this earthquake is in the downgoing oceanic lithosphere related to the Juan de Fuca plate. Below is my interpretive poster map that shows the epicenter, along with the shaking intensity contours offshore and intensity data onshore. These contours use the Modified Mercalli Intensity (MMI) scale. The MMI is a qualitative measure of shaking intensity. More on the MMI scale can be found here and here. This is based upon a computer model estimate of ground motions, different from the “Did You Feel It?” estimate of ground motions that is actually based on real observations. I also label the cities of Seattle and Portland, as well as the three visible Cascades Volcanoes. I placed a moment tensor / focal mechanism legend on the poster. There is more material from the USGS web sites about moment tensors and focal mechanisms (the beach ball symbols). Both moment tensors and focal mechanisms are solutions to seismologic data that reveal two possible interpretations for fault orientation and sense of motion. One must use other information, like the regional tectonics, to interpret which of the two possibilities is more likely. There is no moment tensor for this earthquake, but I place a synthetic moment tensor for the CSZ in the lower part of my poster. I have placed several inset figures. In the lower left corner I include a space-time diagram that shows our current knowledge of the timing of past eruptions for the Cascade Magmatic Arc (Myers and Driedger, 2008). Here is the USGS “Did You Feel It?” felt report map. This map uses the MMI scale to represent the observations that people made and reported using the USGS website here. This shows how these reports (represented by green dots) are evidence that the ground shaking attenuates (“lessens”) with distance from the earthquake. Below is a figure from McCrory et al. 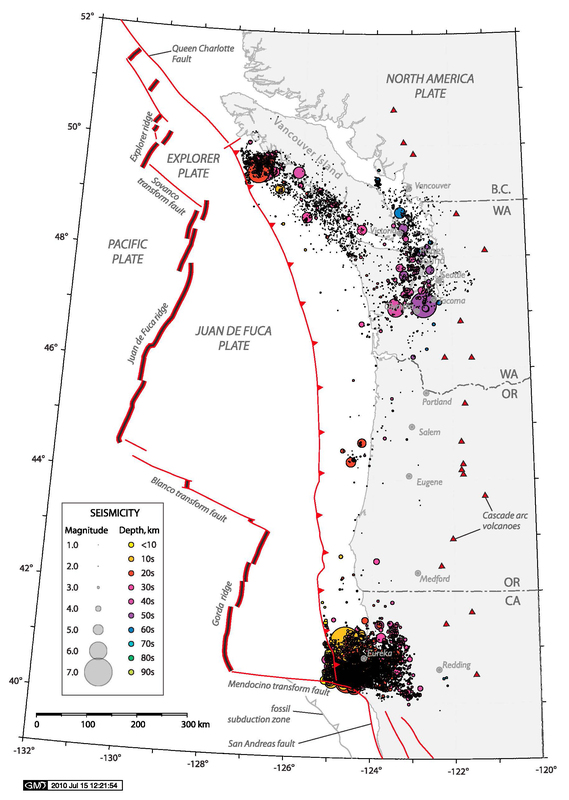 (2012) that shows historic seismicity for the Cascadia subduction zone. This is the seismicity that they used to formulate the location of the megathrust fault presented in the following figures. I include their figure caption below the text in blockquote. 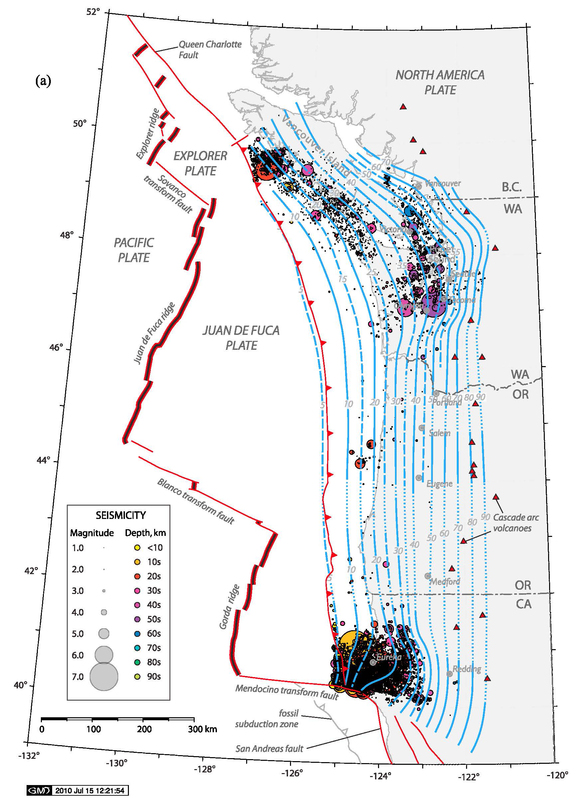 Location map showing uneven distribution of epicenters interpreted to be Wadati-Benioff earthquakes beneath the Cascadia subduction boundary colored by depth range. Earthquakes compiled from ANSS (1975–2009) and CNSN (1985–2009) catalogs based on Juan de Fuca slab model shown in Figure 4a. Transverse Mercator projection, WGS 84 standard parallel 128, centered at 46.8, 128, with standard parallel rotated 3 clockwise of vertical (plate boundaries from Wilson ). Below is a figure from McCrory et al. (2012) that shows the slab contours, as they interpret them, for the Cascadia subduction zone. For some reason, these slab contours were removed from the Hayes et al. (2012) USGS slab 1.0 Google Earth kml file (they used to be there, but are not longer there). There are three figures and are all part of McCrory et al. (2012) figure 4. I include their figure caption below the text in blockquote. 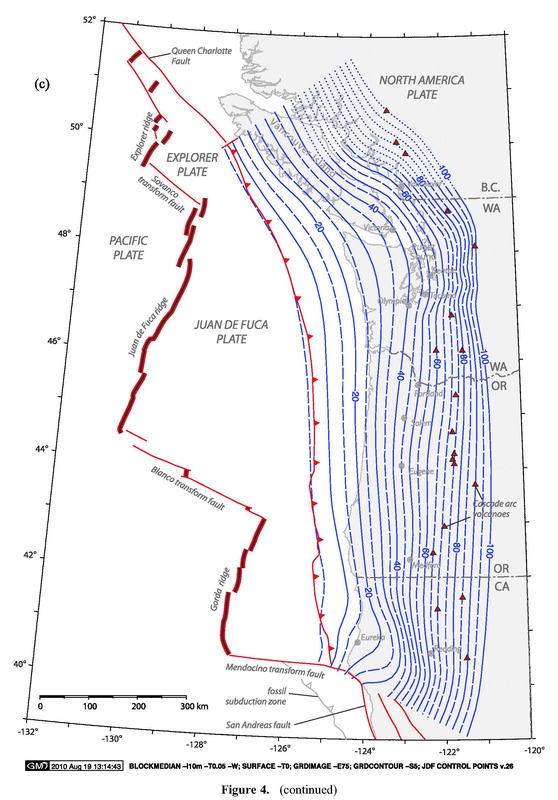 Map showing hand-contoured model of the Juan de Fuca slab surface (see text for description) and seismicity (ANSS, 1975–2009; CNSN, 1985–2009) located beneath the modeled surface. Solid lines denote depth contours in 10 km increments, long dashed lines denote supplemental depth contours in 5 km increments; short dashed lines denote interpolated contours where control points are more than 50 km apart. 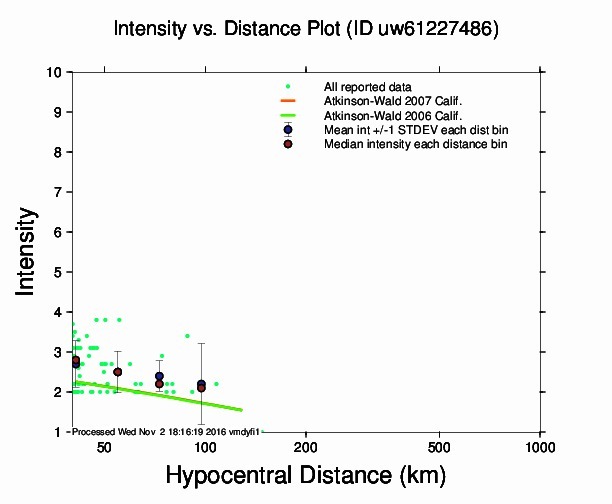 Note that Wadati-Benioff zone seismicity mainly occurs in regions where slab model arches along strike. 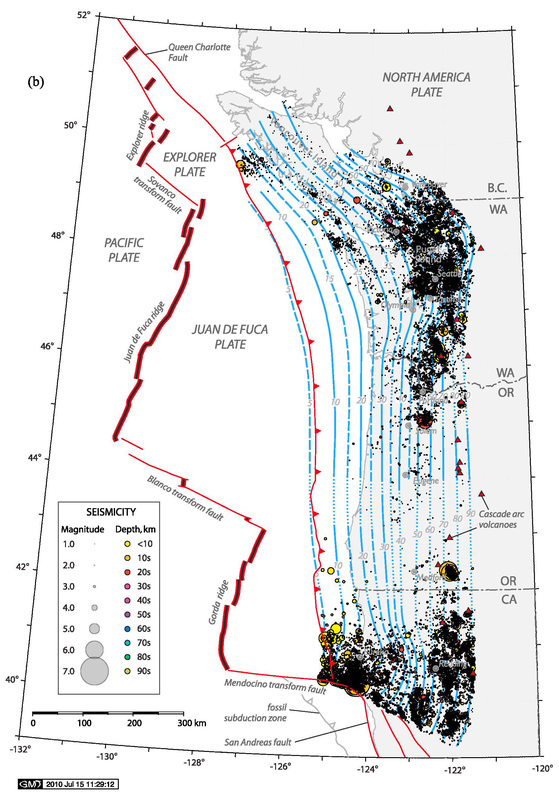 Map showing hand-contoured model the Juan de Fuca slab surface and seismicity located in the Cascadia forearc above the slab surface. Map showing smoothed polynomial spline version of slab model. Solid lines denote depth contours in 10 km increments; long dashed lines denote supplemental depth contours in 5 km increments; short dashed lines denote extrapolated contours. There are several sources of seismicity in northern California, The Cascadia subduction zone, the Gorda plate, the Mendocino fault, the San Andreas fault, the Blanco fracture zone, and within the North America plate. Below are some pages that discuss earthquakes with these different sources. Atwater, B.F., Musumi-Rokkaku, S., Satake, K., Tsuju, Y., Eueda, K., and Yamaguchi, D.K., 2005. The Orphan Tsunami of 1700—Japanese Clues to a Parent Earthquake in North America, USGS Professional Paper 1707, USGS, Reston, VA, 144 pp. Chaytor, J.D., Goldfinger, C., Dziak, R.P., and Fox, C.G., 2004. Active deformation of the Gorda plate: Constraining deformation models with new geophysical data: Geology v. 32, p. 353-356. Dengler, L.A., Moley, K.M., McPherson, R.C., Pasyanos, M., Dewey, J.W., and Murray, M., 1995. The September 1, 1994 Mendocino Fault Earthquake, California Geology, Marc/April 1995, p. 43-53. McCrory, P.A., Blair, J.L., Waldhauser, F., and Oppenheimer, D.H., 2012, Juan de Fuca slab geometry and its relation to Wadati-Benioff zone seismicity: Journal of Geophysical Research, v. 117, n. B09306, 23 pp., doi:10.1029/2012JB009407. Myers, Bobbie, and Driedger, Carolyn, 2008, Eruptions in the Cascade Range during the past 4,000 years: U.S. Geological Survey General Information Product 63, 1 sheet [http://pubs.usgs.gov/gip/63/]. Rollins, J.C. and Stein, R.S., 2010. Coulomb stress interactions among M ≥ 5.9 earthquakes in the Gorda deformation zone and on the Mendocino Fault Zone, Cascadia subduction zone, and northern San Andreas Fault: Journal of Geophysical Research, v. 115, B12306, doi:10.1029/2009JB007117, 2010. Earthquake Report: Italy Update #1!